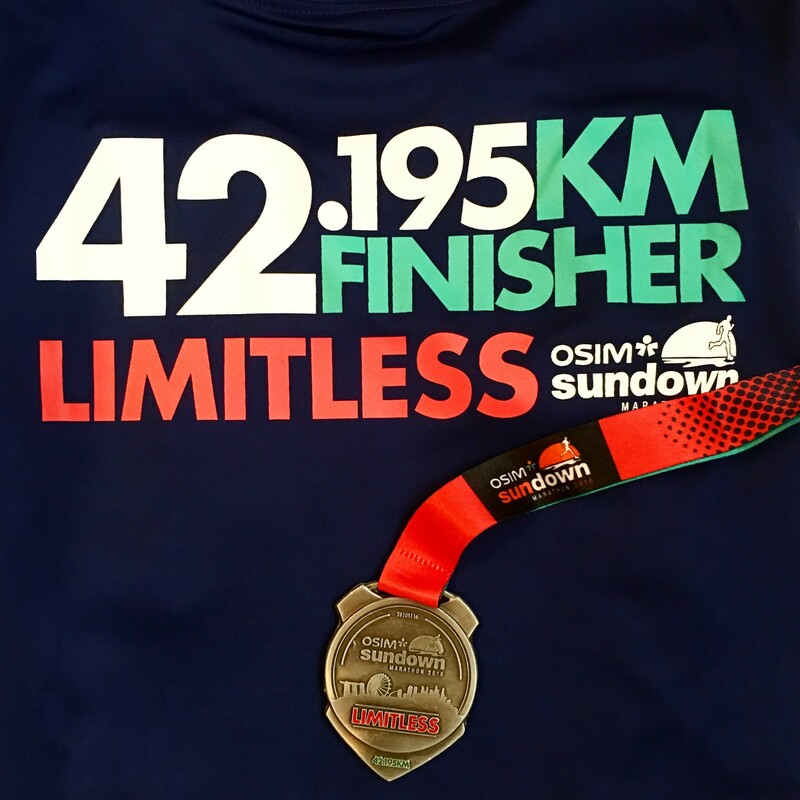 Race Review: OSIM Sundown Marathon 2016 [42KM] (by Roarie) | JustRunLah! I’ve never thought I would strike a full marathon off my bucket list into my second year of running! Flashback, I signed up for Sundown Marathon at the race expo of Standard Chartered Marathon Singapore 2015. The race entry fee was at an attractive price of 85 bucks. Payment on the spot wrapped up pretty quickly and the sign up entitled me a past year race singlet. The deal is sealed and the clock starts ticking! The team began counting down “10 hours to go…” “6 hours to go” (a member turned panicky who started spamming “gan cheong gan cheong over Whatsapp!”) I can totally relate to her mild breakdown lol! With this being my first and also her first 42km run, I was very afraid of what’s in store for us, it felt almost like we are running towards oblivion! Serene – a special shout out to you; if you can read this, I just want to say that I am happy for you, you’ve got yourself into completing the grueling run! About 4 hours before the flag off, we had our final carbs-loading session plus chin chye catch-up that consists of traditional and criss-cut fries at Carl’s Junior, Marina Square. We were happily exploring the wrist bands that were obtained at race venue and jokingly discussed if some of us are going to use the pace/km as a baseline for us to run beautiful but fast enough to meet the cut off. The pre-race jitters were pretty much taken care of as we have been joking around and chatting about other happy things in life. We met up with more friends that we’ve known through various social media platforms and of course we had to do a group shot! And before long, we headed into the start pen! I handed out Haribo gummybears to some of us and it has proven to be a popular pre-race chewy among us. The 5cm by 5cm pack soon went empty by 7km lol! 1 to 4 km – It was a happy go lucky mood for us, Serene started her power walk while Kelvin and Thomas were still near. Eugene and Si Ling went missing in action and probably have rocketed off. It wasn’t a hearing problem for me but I definitely heard Fiqah calling me out in the tunnel! It was great to see her for the first time, after exchanging multiple words of congrats and encouragement over Instagram and Facebook. 7 – 33 km – My nightmare at East Coast Park began. We made an unspoken agreement to regroup at almost each water point. I’m so happy that they offered 100 plus isotonic at most of the water points! At this point, my gummy bears were officially out of stock but there were bananas given! I realized there could a potential shortage of volunteers at some water points. I hope other bloggers could bring out this point. Serene’s power walk sometimes surpassed us guys but we managed to keep up most of the time. We caught the 5.30 hr pacers and I gave the pitiful look to Thomas and Serene. They know what I want and gave me their blessings to go after the yellow balloons. After 2 km, I stopped and realized I wanted to do this with them so I waited at a water point for the trio. As this is my first time doing a 42km, I started feeling discouraged due to the soaring thighs and hurtful soles. Kelvin was so kind to keep watching my back from in front. It was a good time Serene went for a lady break that I did some quick stretching before we ran again. 34 – 40 km – Tummy feels weird. Something was coming. I wanted to give up. I had an emotional and mental meltdown inside. I regretted that I did not ask Serene for cab fare (she offered me tissue though :)) We finally made it out to Bay East and saw the public loo which is approximately 50 meters away but the road leading to it was in the opposite direction which is after a long u-turn into the car park. I splattered, literally. I’m happy I did it and the proudest thing is probably the honor of being able to do this with a group of passionate runners. We started and ended together, leaving no man/woman behind. I could not have survived the mental torture at 26 km if not for them. No matter how fast the pace and speed differs between one and another, be it completing before sunrise or under it in full burning force, every runner at Sundown Marathon 42km did almost the same amount of distance, had our teeth-biting moments; and if there is any extra takeaway, it is the companionship which I deemed to be the most valuable. Click here for more post from Roarie.